Holiday Boy Pick: Stunt Buggy Remote Control Car. Plus 15% off! The Stunt Buggy by MyWebRC.com is a fun remote control car that defies gravity but climbing walls, up garbage cans and whatever else you steer it up! It drives crazy fast! A boy’s dream! It charges up for 30-40 minutes and can run up for up to 25 minutes. The remote control has a range of up to 60 feet. 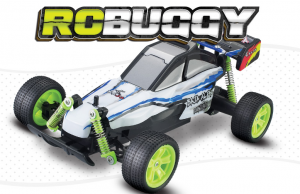 You can buy the RCBuggy on MyFunkyPlanet.com for $29.99. Get 15% off with mywebrvip, expires December 17th. Buy the StuntBuggy.com here. Disclaimer: I received a sample RCBuggy to facilitate this review. As always, all thoughts and opinions are my own. « Cute Smart Phone Speaker – the X-mini. A Gift for the Person Who Has Everything!